That's fresh off one of my pineapple plants. The funny thing: these plants were started with the tops of standard store-bought pineapples, yet the flavor of the fruit they produce is far superior to the fruit we originally bought. They're also a lot less acid. Bonus: Bright, fully ripe, fresh fruit is a lot better for you than the dull, under-ripe, aging produce you find in the store. I recently got a whole bunch of improved commercial pineapple plants for my nursery. When you plant tops, you get smaller fruit than when you plant a vegetatively propagated variety... but if you pick up one of these, you'll get big fruit. Either way, plant some pineapples! If I'm growing pineapple up here in North Florida with almost no work... what's stopping you folks further south? Stick a few dozen around your yard and wait. They'll fruit - I can almost guarantee it. 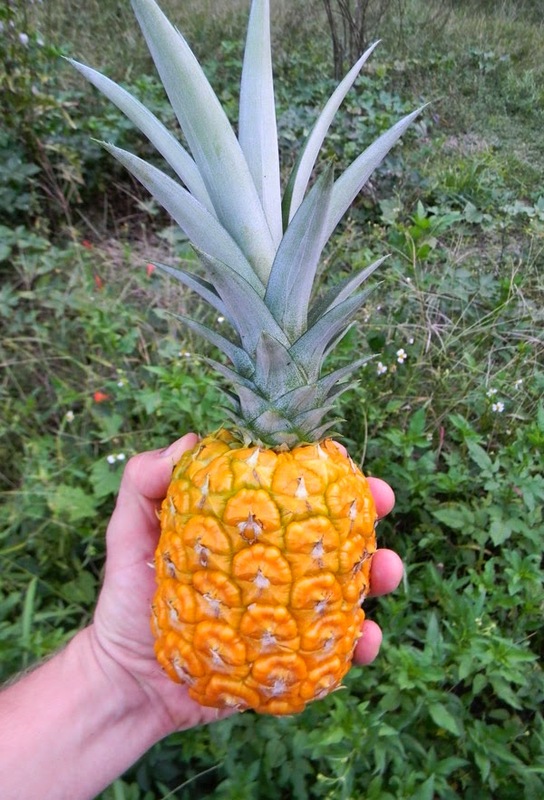 Pineapples are a boon for lazy gardeners... and they're simply amazing to eat fresh. Ingredients: 1 pineapple, 2 qts of water and a cup of sugar or other natural sweetener. Wash the pineapple. Peel it. Place rind in a pitcher big enough to hold both water and rind. Cover and let sit until you see froth forming. Refrigerate for 3 to 4 days until you see bubbles. Strain and sweeten to taste. You will have what is called "Mavi de piña" a slightly sparkling low alcohol beverage. This is great - I'm going to have to try it. Never heard of Pineapple Ale before. Thank you. Me too! Gotta try this. What a great way to use the rind instead of throwing it out. Ain't pineapples great for gardens?!! No work once they are put into the ground! Why can't I get my pineapple tops to do this? I even have 3 that I kept alive all through the winter, and are now huge, but no fruit. Your post made me seek out pineapple plants - none locally (unfortunately), but I was able to find a Florida nursery that sells them online. They certainly aren't cheap, but I remember growing these in Miami and nothing can quite compare to a home grown pineapple. I have a commercial Florida variety in my nursery - e-mail me and I can hook you up. Drop apple core and or peels into heart of plant. Will hasten fruit formation. Works in ours in SW Florida.